Hyderabad as it reflects Hindu-Muslim composite culture, unity: Why the City is the Terrorists' Target? If terrorists are targeting Hyderabad repeatedly, there must be a reason for them. No big city in India has such a multi-ethnic population with Muslims constituting nearly half of the populace apart from a large Christian population. 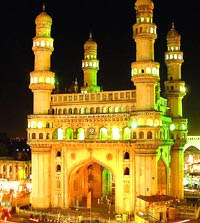 Hyderabad embodies the composite culture of India and proves that peaceful coexistence of Hindus and Muslims is no myth. Also, it is a reflection of the new emerging India, where technology melts into culture and the nerve-centre of computer revolution in the country. Hyderabad is often described as a metropolis simmering with Hindu-Muslim communal tension, which is nothing but false propaganda. Unlike Cities in North India [Moradabad, Meerut, Aligarh], West [Ahmedabad, Surat] and Eastern India [Kolkata, Bhagalpur], Hyderabad has seen communal flash points and clashes but figures of deaths were never in hundreds or thousands. The trouble never lasted for long. It is also one Indian City where Hindus still give houses on rent to Muslims and vice-versa. The culture is a blend of Hindu-Muslim and the speakers of Telugu and Urdu have never had any conflict. Hyderabad is 40% Muslim compared to Delhi (10%) or Mumbai (19%) and perhaps that's why it suits the terrorists. If Hyderabad is attacked, the right wing fringe would readily point finger of suspicion at Muslims. Because it has more Muslims than other major cities, Swapan Dasgupta calls it a 'Muslim republic in the heart of India' and B Raman 'is told' that in 'many' Muslim houses the Pakistan president's photograph hangs. Raman accepted that he never saw it but 'believed' what someone told him, and even recounted it. Huh. When the so-called intelligentsia loses its mental balance and become a part of such nefarious propaganda, it is certain that those who wish to drive a wedge between Hindus and Muslims will smell success. Hindus and Muslims baying for each other's blood--that is the aim of the anti-national forces but that will not happen. Man on the street will outsmart them all--the terrorists and also the fraud intelligentsia. NO, we are united and will remain united AGAINST TERROR. Again a tragedy in Hyderabad but a column on popular website Rediff demonstrates the insensitivity of the writer and the site. It was heart-rending to see elderly parents, both Hindus and Muslims, searching for their sons and daughters among the dead. It was a human tragedy and even ordinary people on the street said that nothing could divide them on religious lines, as it was an attack on humanity. '...during a visit to Hyderabad..I was told that the influence of LeT and HuJI was so pervasive in local Muslim community that many kept in their houses pictures of Pakistani president Pervez Musharraf......what an ambigous word 'many' (it can 10, 10 thousand or a lakh, nice way to dub the Muslim community as traiters). I felt sick. The writer hasn't seen. He just heard it. Ok. From whom? His sources! For sixty years Indian Muslims have been targeted by the extreme right wing as 'pro-Pakistani' and labelled the fifth columnists. When people are picking up their dead in the morning and lakhs of Muslims and Hindus in the City still retain sanity after this dastardly attack, there is such an article based on just hearsay. Firstly those who understand Muslim psyche clearly know that this is the wildest theory which probably just a hardline Bajrang Dal activist could float but not even intelligence officials will take seriously.....Muslims in India don't have any love for Pervez Musharraf, at all. There is no reason for them. Yes we all all terribly shaken by terrorist attacks in India. If some Muslims have been misguided and indoctrinated then why IB and intelligence agencies don't recruit Muslims so that they can penetrate into these cells. Why IB, RAW don't have Muslim officers? And what these high ranking officers like the writer were doing in govt then and do they still have any solution except this sort of Muslim-bashing? What good will the article serves. Spreading canards about Muslims being pro-Pakistanis, will not serve any purpose. It will provoke Muslims, who will feel frustrated and angry. The non-Muslims who may not have thought about it, have again been told that these Muslims are not loyal. Keep repeating such things and people feel that there must be some truth in that. And what good it is for the nation? Link to the column on Rediff is here. Killings, bloodshed across Muslim world: Who are the killers, Who are getting killed? These are couplets of renowned Urdu poet Obaidullah Aleem's ghazal, which I've posted in Urdu, Hindi and Roman scripts Here. The second photograph below is from Qahtaniya village west of Mosul in Iraq inhabited by Yazidis*, where a series of suicide bombings killed 400 persons this week. Country, region, religion, sect, followers of different spiritual leaders, they are all baying for each other's blood. Is it not Iraqi blood? Today blasts and murders are happening from Syria to Indonesia. This is really mindless violence. It is in this context that I have quoted the couplets here. The family of Obaidullah Aleem, a poet born in India, had migrated to Pakistan long back. It was the sectarian clashes in Pakistan that may have prompted him to write these lines. Ironically, Aleem belonged to the Ahmadiyya sect, that believes in Mirza Ghulam Ahmad Qadiyani as prophet, though their split branch, Lahoris, believe him as a mujaddid or reviver, but both sects were declared un-Islamic in Pakistan. I admit that I earlier I was also biased against the sect. But the kind of persecution they have braved, is also unparalleled. Recently I heard another ghazal of Aleem in his own voice. And the melancholy, the intense sadness, in his voice really touched me. It is saddening how this intolerance has made a mess of so many countries in the entire Muslim world. When he read the second couplet, the lack of applause form audience was palpable. Unlike other Muslim sects, the beliefs of Ahmadiyyas or Qadiyanis do disturb mainstream Muslims as they don't believe in the finality of prophetood, which is the cornerstone of traditional Islamic belief. Also, the apparently aggressive campaigns of Ahmadiyyas towards spreading their belief and getting new 'converts', perturb us [though followers of any new movement or sect are generally more zealous]. More so, because Ahmadiyyas have come from within Muslims, which make us a little more uncomfortable compared to those belonging to other religions. Beliefs are a personal matter. We have our beliefs, they have theirs. Difference in beliefs doesn't give the right to any society to deny the right to a peaceful and dignified existence to any group. Any such society will head towards doom. Iraq, Kurds, Sunnis, Shias, Yazidis, Ahmadiyyas, Deobandis Barelvis... I am flying off tangent! 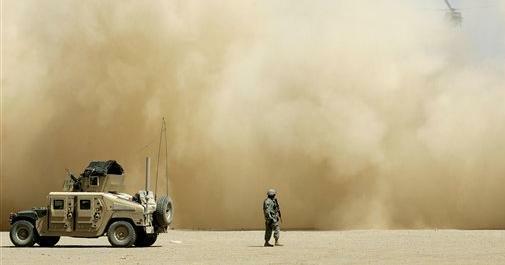 But what we are witnessing in Iraq is a catastrophe of colossal propotions. I must admit that I always felt that the Ahmadiyya persecution was more a propaganda than reality but recent interaction with some people especially an acquaintance's personal account of the way they are treated, was disgusting. In a government office where he was transferred and joined after posting, some persons mistook him as a Ahmadiyya though he is a Sunni Muslim. I don't want to reproduce what he told me, at this blog.There is an outstanding post at ATP about the Pakistan's dilemma regarding their only Nobel laureate, Dr Abdus Salam. Click to read. At a rally in Kolkata, the Imam of Tipu Sultan mosque reportedly fixed a reward on Taslima Nasreen's head. Another Imam asked her to leave the country within a month while yet another speaker gave her just a fortnight. But the statement of Noor-ur-Rahman Barkati, the Imam of Tipu Sultan Mosque, deserves to be condemned. We surely don't need such Imams. Indian democracy gives us ample freedom to stage demonstrations and protests, submit memorandums to the officials and politicians, approach courts and other forums if you feel that somebody has insulted you. The promise of cash reward to a person for executing the death threat is absolutely intolerable. And when it comes from an Imam, it is really unfortunate. Haji Yaqub sought publicity through a similar announcement sometime back. But he was a politician unlike Barkati, who is a religious person. Also, such statements tarnish the image of the community, which is under intense media scrutiny. A section of Muslims appear baffled by the criticism of such actions. They feel it is an issue concerning Muslims alone and doesn't hurt the feelings of Hindus or other communities. A person like Pravin Togadia who issues an open threat to Muslims and says that the minority community should be 'economically boycotted' doesn't invite any criticism from media but a Muslim who speaks out when it comes to his religion and that too against a foreigner [not an Indian], he is castigated. The action of MIM leaders in Hyderabad was condemnable but it was surely not a 'murderous attempt' as English press [and even Taslima Nasreen] claimed. The Muslim organisations must devise a strategy and ensure that nobody is allowed to issue such threats. Togadia's rabid hate-speak doesn't give license to issue irresponsible statements to anybody else. 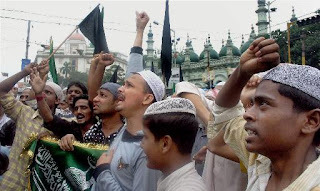 The Darul Uloom Deoband has termed illegal the statement of Barkati at the Kolkata protest and said that any 'fatwa' or statement for execution of a person is unlawful and against the Islamic tenets. Deoband Ulema including Mufti-e-Aazam Maulana Khurshid Alam, Naib Mohatamim of Seminary Mufti Ahsan Qasmi and Mufti Muhammad Arif, criticised Barkati. In a joint statement the trio said that there is no right to any clergyman to issue such decrees in a democratic set up like India. Nothing wrong in Jew-Muslim dialogue: Shouldn't Muslims visit Israel, talk to Jews! The news of the visit of a delegation of Indian Muslims comprising the president of All India Imam Organisation, Maulana Jamil Ilyasi, has kicked up a row. Almost every Muslim organisation in the country has criticised the visit. The Raza Academy, Muslim Convention UP, Majlis-e-Ulama, Jamiat-e-Ulama, Qazi Council, All India Muslim Majlis-e-Mushawrat and Muslim Personal Board have condemned the tour. There are allegations of these people having sided with the 'fascist forces' from the very beginning, charges of them selling Muslim interests in lieu of Jewish money and supporting the Zionist cause. There is clamour for their social boycott as well. As far as I am concerned, I feel it is an over-reaction. All over the world groups with diametrically opposite views are meeting so why can't some Indian Muslims hold dialogue with the Jew leaders. For decades Indian Muslims and their newspapers have spent gallons of ink, for the Palestinian cause. But when countries of Middle East who fought wars with Israel, have established links with the Jewish state, why should it remain a taboo for Indian Muslims to talk to some Jews. Undoubtedly the Palestinians have suffered at the hands of Israel. But why the Muslim world always forgets, that it was the shrewd politics of Britain and its allies that made Israel, a problem for Muslim world. For centuries Christian world committed atrocities on Jews while they lived happily under Muslim states. It was in European countries where Jews were forced to dress distinctly to be identified, blamed for spread of epidemics, humiliated for centuries and it was there only that millions were killed during Holocaust. And how 'intelligently' Europe got rid of its collective guilt. The masters of divisive politics who had divided Indian sub-continent on religious basis, decided to create the Jewish state in the heart of Islamic world, and in one masterstroke shifted the entire problem from Europe to Asia. So Muslims who had fought crusades against Christian world for centuries and had been victims of Christian inquisition in Spain along with Jews for at least three centuries, forgot everything (good though) and for every wrong they started blaming Israel and seeing a Jewish hand. If Sania Mirza decides to pair with Shahar Pir, there is anger in India. Why! Jews and Zionists are different. In fact, there are the orthodox groups of Jews that have been against the establishment of Israel, like the Neturei Karta. See the photo of Jews protesting the Israeli occupation of Palestine here. A group of Rabbis had even met Iran's premier Ahmedinejad. That is just to put forth the point that all Jews can't be alike or anti-Muslim, as many Muslims feel. I fail to understand the kind of outrage whenever Israel or Jews are mentioned. Yasser Arafat could talk. Egypt, Syria and even Pakistan can have links with Israel. Why can't Indian Muslims! Let Burney Sahab go to Israel and remind the Jews a few things about their history and how Muslims acted as their protectors for centuries when the Christian West was baying for their blood. I had written a post on this subject 1-1/2 years ago which is available here. 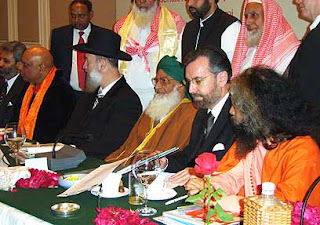 The photo above is that of an interaction between Muslims and Jews at the inter-faith summit held in Delhi sometime back. These are all couplets of Mast Kalkattvi. This poet from Calcutta (Kolkata) was a contemporary of Josh Malihabadi and Firaq Gorakhpuri. His popularity knew no bounds in those days. True to his pen name Mast Kalkattavi, lived a bohemian life. He was born Syed Ghulam Mohammad and had adopted the takhallus 'Mast'. He was born in 1896 and passed away in 1942. Considering that he was such a popular poet, it is surprising that hardly any serious work done on his literary legacy. I couldn't find a single result in Google for his name. Read all these couplets in Urdu, Hindi [devanagri] and Roman English scripts at Best Ghazals. The Barelvis don't let Deobandis enter their mosques though both are Sunnis.. And the latter don't tolerate the entry of the former in their mosques. It happens in many regions in the country but when the reports come from....of all places...Gujarat, it is really shocking. In Saurashtra-Kutch region the Barelvis have put up boards at the entrance of mosques, asking the Deobandis not to step into the mosques. Syed Khalique Ahmed reports in Indian Express that a Commandant, a judge and a sub-inspector were turned away in separate incidents, from the 'Barelvi' mosques. And one, Maulana Shabbir Ahmad Siddiqui, even justifies that why Deobandis can't be allowed to pray in the mosques of Barelvis. I have personally experienced this Barelvi-Deobandi schism. 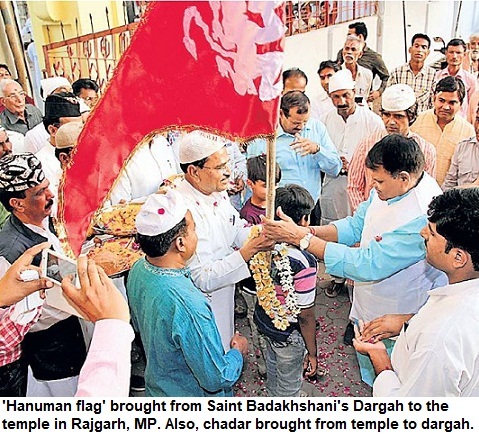 In the Bundelkhand region of Uttar Pradesh and Madhya Pradesh, as also in Chhattisgarh, there are cities and villages where Muslim localities are clearly divided on these lines. Though followers of both Barelvi and Deobandi schools are Sunnis, the divide is such that even the dead are not allowed to be buried in the graveyard of the group belonging to the other school. After riots the feeling had seemingly diminished for a while in Gujrat but it's back to square one, again. Ironical indeed. 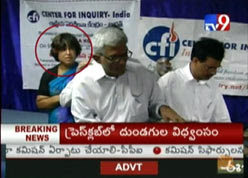 The MLAs of Majlis Ittehadul Muslimeen [MIM] created ruckus at the Taslima Nasreen's press conference. The Bangladeshi author who had to leave her country, had reached Hyderabad for the release of her book. Rather than assault on her, as many reports described the incident, I would call it ruckus. Mercifully she didn't get injured. As far as Majlis is concerned, it has done little good to add to its existing 'reputation'. Worse was the reaction of MIM leaders when they were contacted by news channels as they failed to put their point across [even though their behaviour was not at all justified]. The MIM chief Sultan Salahuddin Owaisi kept repeating that the 'attack' was justified but failed to say what exactly was his problem with Taslima's writings. Most of his MLAs, except one, who spoke to channels, were simply irrational. They had nothing to say that could in any way justify their rage and express their point of view. At least, the leaders of Shiv Sena [which MIM seems to be emulating to an extent], are articulate enough that they even justify the unjustifiable. I am sure this comparison will anger many people but a peaceful protest with black flags would have been a much better idea than MIM activists barging into the Press Club premises and creating nuisance. I wonder why Asaduddin Owaisi didn't speak to media. At least, he is articulate. 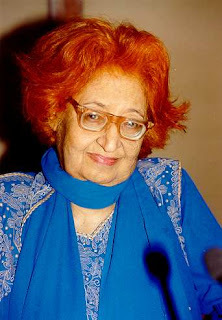 As far as Taslim Nasreen's writings are concerned, she is no great writer. Recently I finished one of the volumes of her autobiography. She is self-obsessed. There is, of course, enough masala to compensate: like explicit description of her lesbian affair with a woman in Europe, her failure to learn secrets of giving oral pleasure and her thoughts at the sight of innumerable human phalluses of all size and shapes at a nudist beach. Khair. 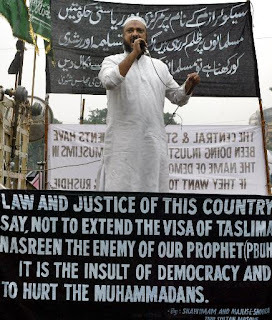 Tasleema Nasrin may be a bad writer but this sort of protest is absolutely unwarranted. LINK to Karan Thapar's long and interesting interview with Nasreen at CNN IBN. She doesn't come across as an intellectually profound person, rather one finds her quite shallow. The video is also there at the same link. It is a must-read transcript. Renowned Urdu-Persian poet and freedom figher Saraswati Saran Kaif, who wrote over 52 books, and was a close associate of Firaq Gorakhpuri, recently passed away. But unlike many prominent Urdu writers*, who happen to be Muslims, and their children can't read or write Urdu, Kaif ensured that his sons--one a scientist and the other a chief general manager with the Reserve Bank of India, and the youngest, a daughter, learnt Urdu. In fact, one of his sons is proficient in Persian as well. Kaif was 84 at the time of his demise. Apart from poetry, novels, stories, Kaif translated works from Sanskrit, Russian, Arabic, French and Persian. Sometime back I had met Kaif and was discussing how a person can still be romantic at the age of eighty. 'The other day I woke up in the middle of night, suddenly remembered a scene when I was 16 and wrote the ghazal'. He had recited the ghazal to me. He had spent most part of his life in UP, Delhi and Punjab,working as journalist. Maulana Zabih brought him to journalism and apart from working for Tej, Ansari and along side Ganesh Shankar Vidyarthi, he also got actively involved in freedom movement and was jailed. He retired from The Tribune in 1982. He was living a life of solitude in Benares and later at his daughter's house in Bhopal where he died. *The children of umpteen Urdu poets can't read Urdu. Even past legends like Kaifi Azmi and Sardar Jafri couldn't teach the language to their children though they may speak it. Adnan Mulla, a bright youth, was kept in illegal detention for 35 days and subjected to torture, forcing him to 'confess' that he was amongst those responsible for the Ghatkopar bomb blast in 2003. After over a month when the police officials apparently got tired of their third degree measures and he didn't fall in the cops' trap, Mulla was framed under POTA and sent to jail without any charge sheet against him. He was about to get married within a few days and his fiancee, with henna on her hands, had to run to the police station and courts along with rest of the family members. Nearly 4-1/2 years have elapsed and she is still waiting for him to be released. The High Court says that if there is no evidence, a POTA accused can get bail in three years but this is the fifth year and he is yet to get out of the prison. His family used RTI to find out the truth about the illegal detention for 35 days. On the basis of this proof, the family approached POTA court for bail, but even after six months of filing of the application the hearing is yet to take place. Muhammad Adeeb writes in Rashtriya Sahara (Urdu) about the plight of young Muslims in Maharashtra who were falsely implicated under draconian laws like TADA and POTA. And this is not a lone story. There are hundreds of similar tales of harassment of Muslim youths whose lives have been shattered in the last decade-and-half. 'We believe that an offender should get maximum sentence and must pay for his crimes but innocent Muslims youths who were framed all over Maharashtra in false cases for several years should get justice', he further writes. Mulla's only fault was that he happened to be the relative of Saquib Nachan. The Maharashtra police faces innumerable similar charges of framing innocent youths and putting them behind bars, to show their efficiency by making such arrests. Ironically the Congress-NCP government that had come to power in the state on the plank of justice to minorities, implementation of Sri Krishna Commission report and umpteen such promises, has failed to put a check on such atrocities.